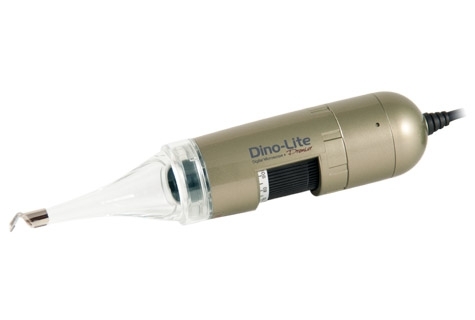 The Dino-Lite Premier AD4113TL-MA1 is a long working distance model providing more distance to work with at higher magnifications, and capable of changing the front cover to better adapt to different applications. It comes with a standard transparent front cap for normal use, a closed cap to protect the lens to protect the LED lights from dust, debris, and moisture, and an additional angle mirrored cap to look into tight spaces such as BGA inspection. It uses enhanced 1.3 megapixel sensor that offers improved low light visibility to see more detail when lighting is not perfect. Included with the AD4113TL-MA1 is a copy of the DinoCapture 2.0 for PC’s or DinoXcope software for MAC to capture either a photograph, video, or time-lapsed video within a few simple clicks. It also has measurement and measurement calibration capabilities for precision work.